Our Junior Division includes Grades 4 - 5. With a foundation of literacy and numeracy well underway, boys develop and hone their skills in reading for meaning, writing with purpose, and oral and visual communication. 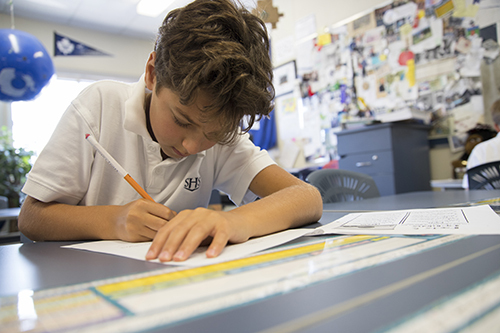 Boys begin formal training in public speaking, a hallmark of the academic year for Grades 4 - 8. Boys become increasingly adept at communications media, managing information, reflecting on their work and developing sound, lifelong approaches to good writing. In mathematics, boys continue to use problem solving to explore the five strands of mathematics (numbers and operations, algebra, geometry, measurement, data analysis and probability). 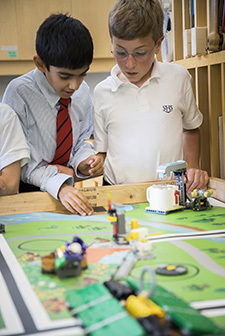 In addition to core subjects, Junior boys receive specialized instruction in art, drama, French, music, healthy and physical education, and science. Lessons and discussions connect the classroom experiences to realities in the outside world. Class trips include several day trips to historical and cultural sites as well as a three-day/two-night adventure at an outdoor education centre in Ontario.